Trump’s boasts about keeping Colin Kaepernick unemployed may actually help him find work. Donald Trump wants to end Meals on Wheels and has an alleged Nazi on his staff. Colin Kaepernick just gave $50,000 to Meals on Wheels and has consistently stood against racism. Donald Trump has an approval rating that dipped as low as 37 percent last week. Colin Kaepernick at one point last year had the best-selling jersey in the NFL. Donald Trump has inspired followers to vandalize churches. Colin Kaepernick has inspired young people to think and act politically for the first time in their lives. Donald Trump was part of a chorus of people threatening Colin Kaepernick during the 2016 season. Colin Kaepernick responded with his best statistical season since 2012. If anything, Trump may have done Kaepernick one hell of a favor. 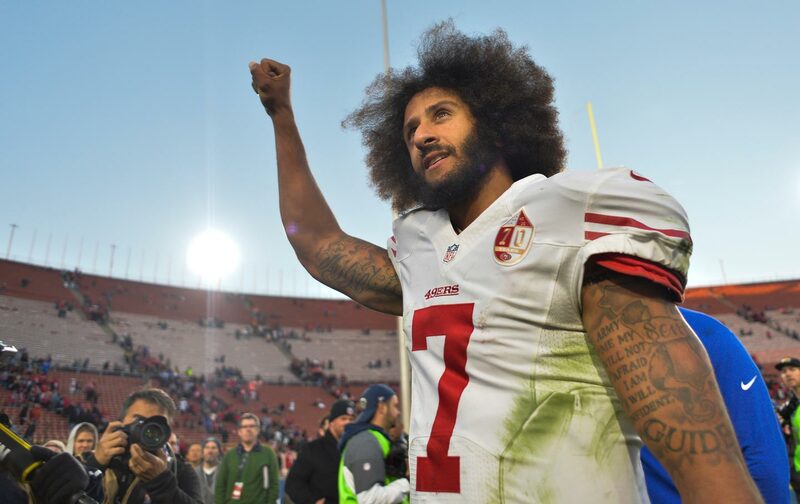 By boasting about his ability to strike fear into the hearts of NFL owners—many of whom gave small fortunes to his campaign—he may have revealed evidence of “collusion” or what is known as “tortious interference,” or “the intentional interference with contractual relations.” Trump could have inadvertently handed Colin Kaepernick a lawsuit on a silver platter—or put a tremendous pressure on the NFL to find one owner willing to bring Kaepernick into training camp. That part about “coordination with a team owner” sounds particularly dicey when we consider Trump’s close friendship with New England Patriots owner Bob Kraft, who was a guest on Air Force One the day before Trump’s speech. Then there is Trump mega-donor and Jets owner Woody Johnson, who is being named ambassador to the United Kingdom. The list of NFL-owner entanglements with this president goes on. Trump—who is engaged in his own war against “leakers”—may have “leaked” evidence of collusion. This unforced error also fits a pattern of a White House team so incompetent, so eager to score points on cable news, and so absent of impulse control, that they can’t help but get in their own way. Their incompetence has been the saving grace of this administration so far. It also might be the saving grace of Colin Kaepernick’s career as an NFL quarterback.